I am a fool for stirling engines, and well steam engines of all kind, but this collection of candle powered amaze me and make me smile. The candles in question are simple tea lights. O, I want one of these so bad! I wonder how much one would cost, how loud are they, and how much space they will take up in my office. 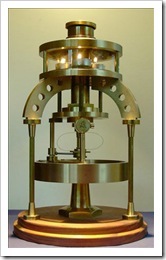 Definitely check out the rest of the pictures at DVICE and the video of one of these Stirling engines in action below. I love this stuff.